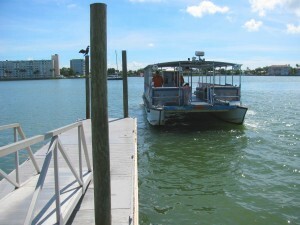 Going to Clearwater Beach has always been enjoyable but now the Clearwater Ferry has added a bit more to the experience. One of the things we sometimes hear at our Florida Beach Rentals offices is that our customers are in traffic on their way to Clearwater Beach. 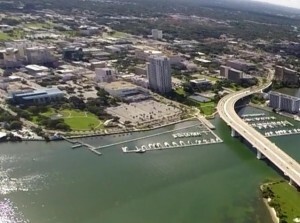 While Clearwater Beach traffic doesn’t compare to places like New York or Los Angeles, it can take a bit of time to get over the bridge to our island on a Saturday afternoon. 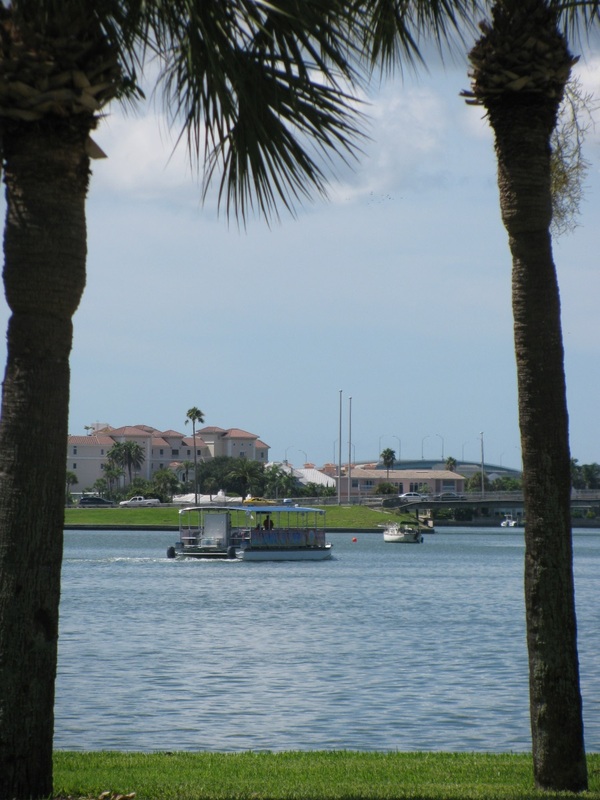 More than once we discussed how nice it would be to have a water taxi to get across Clearwater Harbor on busy days. Apparently, we were not alone. 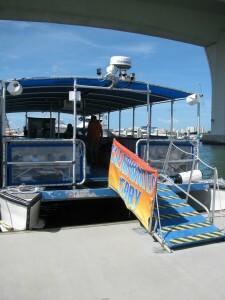 The owners of The Tropics Boat Tours recently launched a water taxi to make the crossing. The Clearwater Ferry starts at Coachman Park, home to many of the City of Clearwater’s favorite festivals. A large paved parking area flanks the park and, in this case, the parking lot is the main attraction. While parking on Clearwater Beach tends to fill up and cost money, it is free in the spacious lot next to Coachman Park. The parking lot puts you in a good location too. The lot is next door to both the Clearwater Public Library and Winter’s Dolphin Tale Adventure, which is a museum-style display based on the Dolphin Tale movies that star celebrity dolphins Winter and Hope. Also nearby is well-known Cleveland Street with the Capitol Theater, a number of restaurants, and a Starbucks. 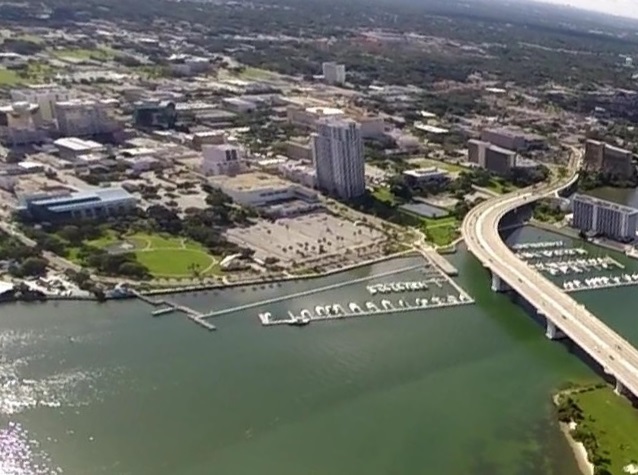 While the whole point might be to get across the water to Clearwater Beach, it is also nice to know that the amenities of Downtown Clearwater are within easy reach. The Clearwater Ferry waits for passengers at the foot of the pier, just under the bridge. Signs lead the way to the loading ramp, just in case you don’t see the vessel right away. Boarding is easy and plenty of seating lines the perimeter. The ride goes quickly, but despite that, plenty of great scenery goes by. The tranquil waters of Clearwater Harbor glide under the ferry while it plies its way alongside the causeway. To the left stands an uninhabited mangrove island that has become a bird sanctuary. Birds always fill the branches or stand in the shallows of this harbor landmark. The docking arrives sooner than you might expect, the ride only taking perhaps 5 minutes. An unexpected perk arose near the end of the Clearwater Ferry ride. Working on Clearwater Beach made me curious about the ferry service and whether it would be feasible on heavy traffic days like weekends or holidays. To my surprise, the pilot explained that they now drop people off at the Clearwater Beach Library at no additional charge. The extra distance went quickly and when we arrived, I stepped onto the shore a mere block from where I worked. With service to the main marina and the library dock, much of the beach is covered. For many employees, these two stops eliminate most of the walking. For tourists, the disembarking sites lead to the two most visited areas of Clearwater Beach. The Clearwater Ferry is even considering an additional stop to the southern end of Clearwater Beach which would make the entire public beach area accessible on foot after disembarking. Aside from being convenient and affordable (day passes $3 to $8) the ferry is an enjoyable ride. 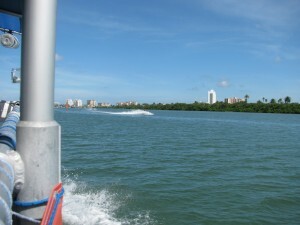 While the route never varies, it does go through a channel used by many of the tour boats while out on the harbor. The views are fantastic, as they always are while out on the waters of the bay. It is hard to imagine a more scenic route to get to work.